The Troy 0.750 Low-Profile Gas Block is made specifically for rifle barrels that have a 0.750 gas block seat. The low-profile design allows for clearance of most aftermarket rails that require a smaller gas block. Machined from 4140 pre-hardened steel finished with MIL-STD Manganese Phosphate. The Troy low profile gas block fits tightly to the barrel using two set screws. Gas tube roll pin not included. Available in Black. Troy?s .875 Low Profile Gas Block is made specifically for bull barrel rifles that have a 0.875 gas block seat and Armalite 0.308 heavy barrel and other calibers. Machined from 4140 pre-hardened steel finished with MIL-STD Manganese Phosphate. Gas tube roll pin not included. Available in Black. The 2" Low Profile Gas Block is made to cover the area under the fixed sight gas block and hides taper pin holes. Machined from 4140 pre-hardened steel finished with MIL-STD Manganese Phosphate. Gas tube roll pin not included. Available in Black. The Ambidextrous Bolt Release is an indispensable device that easily releases or holds bolt open with one hand to streamline firearm clearing and reloading after a malfunction. By being ambidextrous, this bolt release eliminates hand changeovers improving control of rifle when in use. Made from hardened aircraft aluminum. Available in Black. 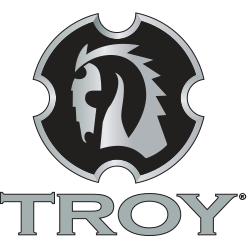 *Lifetime limited warranty, see www.troyind.com for details. The Troy Standard AR15 Barrel Nut is a rugged alternative to standard barrel nuts. The TRX Barrel Nut is a proprietary barrel nut designed specifically for TRX BattleRails. Note: Will not work with the Alpha Rail. This front grip is your solution to a front grip that attaches to any MIL-STD Picatinny Rail without tools. The Troy CQB Vertical Grip attaches to any MIL-STD Picatinny Rail without tools featuring a waterproof storage compartment and aggressive ridged pattern for an enhanced grip rounds out this lightweight option for a vertical grip. Machined from billet aircraft aluminum and finished in hardcoat anodizing. This front grip is your solution to a front grip that attaches to any MIL-STD Picatinny Rail without tools. Made from Troy proprietary military-grade, chemical, biological and impact resistant polymer, the CQB Vertical Grip will not heat up during rapid fire or full auto fire. A waterproof storage compartment and aggressive ridged pattern for an enhanced grip rounds out this lightweight option for a vertical grip. The Enhanced Trigger Guard allocates user with easy access to the trigger while wearing gloves and opens trigger area even in extreme conditions. With no sharp edges or corners, this trigger guard fills width gap on receivers. The Enhanced Trigger Guard is machined from hardened aircraft aluminum and rotates down like a standard trigger guard. Durability and dead-on accuracy make Troy BattleSights the hands-down first choice of Special Ops and Tactical Users Worldwide.Troy's HK Front Folding BattleSight is easy to install and deploy, with no levers or springs to fumble with. No tools required for adjustment.